When we have the first sight of the old house which seems ordinary, we know it has potential to be the hair salon and residential which have interesting spatial pattern and startling style. 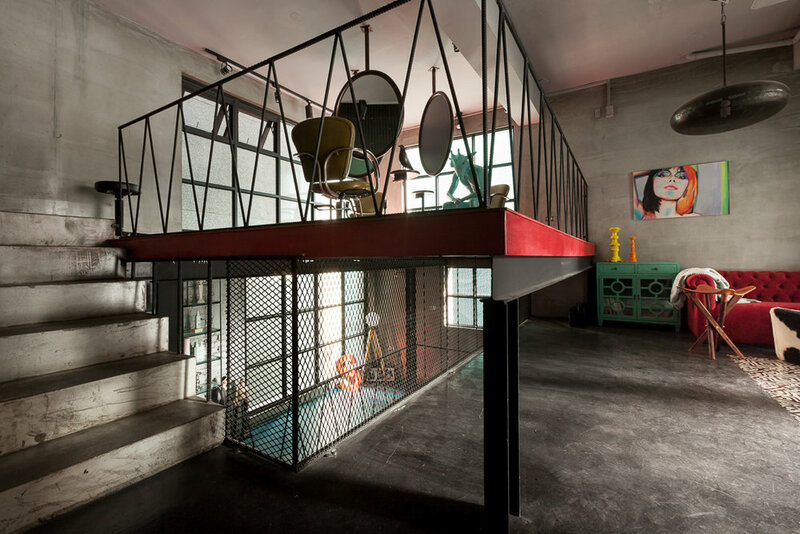 According to client’s unique perception of art work, we anticipated the house after renovation would be modern and retro at the meantime, and very boldly colored. The first renovation we did is trim the scale of original split-level which looks heavy and enclosed, in the end, it turned out to be open and penetrating split-level which make space has more the sense of multi-level. 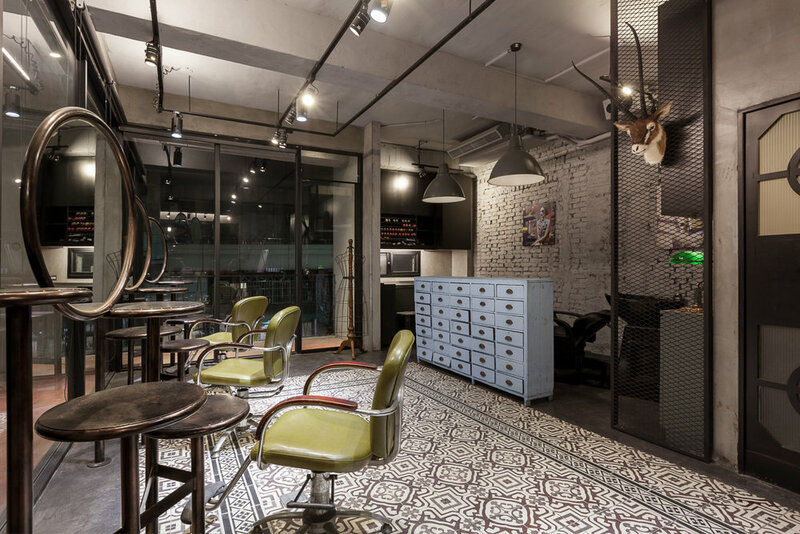 In the first floor, we use plenty of Loft elements like pipes mirror, container wall, chairs in aeronautic industry style and concrete as basic tonality with bold color woods, make client’s art collections as embellish to create the fantasy atmosphere for this hair salon. When people walk through the first split-level with splendid color and turn into the second floor, the (boxing) arena-looking split-level with red-dyed wood is the prime focus of the whole space, and look through the metal net, people still be capable of viewing the art collections located on the first split-level. On the other side of second floor, we use retro decorative tiles in black and white to match the mottled white brick wall and the vintage cabinet in unique blue and also client’s collections. 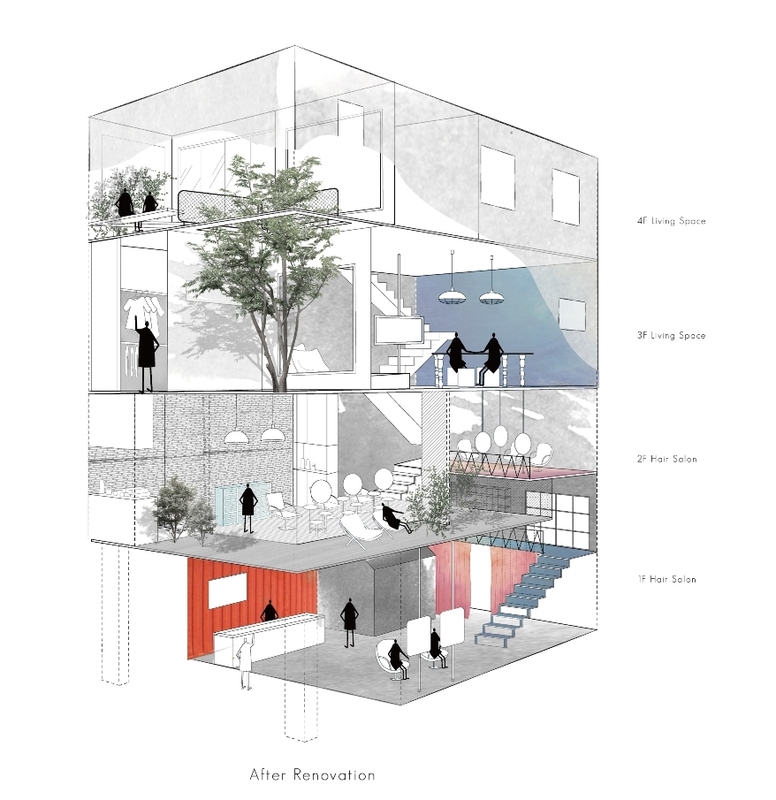 We did not make the maximum space for commercial use, instead, we remain the balcony for nature. Going upstairs along the sunlight and shadow of the trees into the third floor is the entrance of client’s residence, the balcony full of sunshine and green trees come into view, red book case as concealed door is the entrance of dressing room just next to the living room and dining room. The huge tree at the balcony can reach to the fourth floor due to the atrium of balcony. In the bedroom, we use the dark purple wall and dark purple celling with white décor molding to match amaranth curtain and neon orange pendant lamp which was rarely seen in residential bedroom, the startling choose to meet client’s request. Thanks for client’s acceptance of our various, subversive, and unlimited thoughts of design so that we are able to play this rhapsody of renovation we would never forget.